Did you know that the most common new year's resolution has to do with getting in shape, according to a Nielsen survey? Honestly, I used to be one of those people who vowed every January 1st to go on a diet. Nowadays, I've shifted my mindset to staying healthy and fit, rather than focusing on restricting myself and losing weight. I've come to find that when I restrict myself or limit myself to foods I love, I binge eventually. Obviously, that leads to the opposite result I'm wanting. I've managed to maintain a 20-pound weight loss for 6 years by keeping in mind and implementing some of the activities and mindsets below. Hopefully, these will help you shift from a thinking of "restriction" to a mindset of "healthy and wellness". I used to not like drinking water. I know that sounds odd. Water really doesn't taste like anything so how could you not like it? Well, I did. I would only really drink it at restaurants. Instead, I'd sip on diet sodas day and night. I made a conscious decision to replace sodas with lemon water and have been doing so ever since. Now, I definitely still drink diet soda, but I also drink water all day long. Adding lemon or fruit slices helps it taste better, too! I got myself cute water bottles and glasses to really spruce up the experience. Nothing "kills the dream" faster than a boring workout. I'm all about something that's high-energy, makes me sweat, and has great music, which is why I enjoy POP Pilates so much... and also because it's free. Find something you actual enjoy doing, whether it be yoga, training for a marathon, or playing sports. If you find something you love, it's easier for you to maintain a positive attitude while doing it. I am a huge believer of making grocery lists before heading to the store. 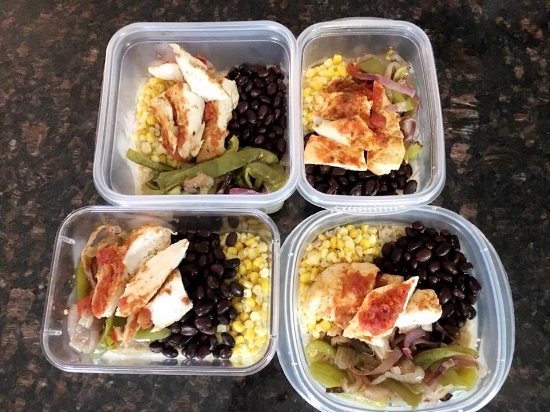 I pick out 3 to 4 meals I want to make that week and put the necessary ingredients on my list. Before heading to the store, I also virtually "clip coupons"! In other words, I go prepared. I get only what's on my list. Every now and then I'll pick up a "treat" for J and I, but very rarely do I stray from it This not only helps us save money, but helps us stay consistent with our eating habits. Plus, I know exactly what we're eating for lunch and dinner each week so I can prep ahead, if possible. Umm... there's really no explanation needed for this tip. Buy yourself some cute and fun workout clothes so that you feel stylish when sweating. I love buying cute activewear because, more often than not, I'll work out and run a few errands right after, so I need to look somewhat put together when popping in and out of stores. I'm an emotional eater. I eat when I'm happy, sad, frustrated, anxious... you get the idea. Nothing triggers unhealthy gorging in me more so than when I'm feeling anxious. I think it's because subconsciously, I feel like food is the only thing I can control at that moment. Ironically, I tend to get out of control with it fast. I make an effort to calm down and take a moment to myself every day, whether it be to go for a walk, take a hot bubble bath or mindlessly watch some reality TV (90 Day Fiancé anyone?!). If I nip the stress in the bud, I can avoid destructive eating. De-stress your mind and de-clutter your living and work spaces. I'm a very organized person and pride myself on keeping our living spaces just as tidy. If I have a dirty house, you bet you I can't think straight. Truly- I physically have trouble keeping things straight in my head if I have dirty dishes in the sink, pillows on the floor, clothes on the chair. It's crazy. When your work and living spaces are clean, you create a clean slate and a mentally comfortable space to live, work, and play! I remember when I was initially on my weight loss journey I read a quote on Pinterest that said, "nothing tastes as good as healthy feels." I re-played this quote in my head on nights when I was standing in front of the fridge wanting to pig out on ice cream sandwiches, and luckily, it snapped me back to reality. It's true. I love trying on clothes and actually feeling confident in what I look like. A cupcake may temporarily make me feel good, but I know that I eventually go down a long road of shame and regret a few minutes after finishing. Whether it's beach vacation or an old dress you're dying to fit into again, set motivators for yourself. I'm not a licensed dietitian or nutritionist, so this is clearly my own advice, but I'm a big believer of getting on the scale every day. Some people claim that the scale is only a vanity tool and that feeling good shouldn't come from a number. Okay so yes and no. If you're trying to lose weight, you need to get on the scale. Getting on the scale each morning, for me, helps me see how my eating the day before affected my body. Plus, if I notice a creep up in the scale, I'll adjust my exercise and food accordingly. It holds me accountable and I make sure that I know exactly where I stand as far as my goals are. Studies show that those who make their beds in the morning are over 200% more like to be millionaires. I'm destine for a life of the rich and famous if that's the case. But seriously- making your bed in the morning puts your mind in a productive state. You're able to cross a chore off your list and move on to the next. Plus, who doesn't like getting into a nice cozy bed after a long day? Of course, you're going to slip up! You're going to wake up some days and definitely not want to work out. You're going to come home after a long day of work and not want to cook a healthy dinner and decide to pick up fast food instead. Hey, life happens. Holidays happen. Birthday Parties happen. Vacations happen. You fall off the wagon. Don't stress! The more you panic about eating more chips than you planned to at a Mexican restaurant, the more likely you are to give up your journey to success all together. Tomorrow is a new day, and a new you if you're ready. Start again!